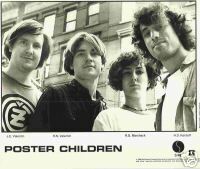 The Rundown: Poster Children, from Champaign, Illinois, got started in 1987 with Matt Friscia, Rose Marshack, Jim Valentin, and Rick Valentin. Classified as Indie Rock and Post- Punk, Poster Children has released 12 EPs and albums since 1989: “Toreador Squat” (1989), “Light into Dark” (1989), “Flower Power” (1989), “Daisychain Reaction” (1991), “Tool of the Man” (1993), “Just Like You” (1994), “Junior Citizen” (1995), “RTFM” (1997), “New World Record” (1997), “DDD” (2000), “No More Songs About Sleep and Fire” (2004), “On the Offensive” (2004). Poster Children have a pretty unique sound, especially when compared to today’s music. You can really hear the Punk in their music, and it’s wonderful. My favorite album from Poster Children is RTFM. It has a nice blend of Punk and Rock sounds and it also contains a song I’ve often thought about using as the theme song for this site, “Music of America“. But then I think that would make them sellouts so I stop thinking about it. The song is really good though, and you should check it out, as well as some of their other songs like “21st Century“, “King of the Hill“, “Attack!“, “He’s My Star“, and my favorite, “0 for 1“. MarsBands.com really likes Poster Children and loves the message of their music. Be sure to look into these guys, there’s lots to like.